Hot Wheels' "Greetings from Space" Tesla Roadster toy celebrates SpaceX's February 2018 Falcon Heavy launch. Eight months after SpaceX launched a Tesla Roadster into space, the sports car can now be found 170 million miles (274 million kilometers) away from Earth — and on local toy store shelves. Mattel has released a new 1:64 scale model of the "1st car to orbit the Sun" as part of its Hot Wheels line of toy vehicles. A Hot Wheels Tesla Roadster, modified with a miniature version of the real car's "Starman" driver, was mounted to the dashboard of the midnight cherry electric convertible for its trip through space. "Greetings from Space" reads the postcard-styled backer card for the new Hot Wheels toy. 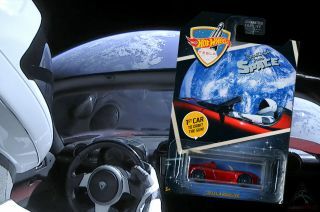 The packaging features a real image of the 2008 Telsa Roadster in orbit, taken from a video that was beamed back to Earth in the hours following SpaceX's Feb. 6 maiden launch of its Falcon Heavy heavy-lift rocket. The blister pack also features a unique Hot Wheels logo in space mission patch format, depicting the Falcon Heavy lifting off and the Tesla logotype. Elon Musk, who founded both SpaceX and Tesla, chose his own Roadster for the historic test flight's payload, substituting the sports car for the more typical mass simulators. The back of the card lists statistics about the out-of-this-world Roadster, including its top speed ("77,000 mph measured March 13, 2018"), the time it will take for it to complete one orbit of the Sun ("557 days") and when the car will next swing by the Earth ("estimated 2073"). In the days following the Falcon Heavy launch, sales of previously-released Hot Wheels Tesla Roadster cars soared on eBay, where the $1.09 toy commanded as much as $100. Eight months later, the sets were still selling for as much as $30 a piece, though they could also be found for less than the original retail price. Hot Wheels' "Greetings from Space" Tesla Roadster blister pack. The new SpaceX edition of the Tesla Roadster toy uses the same body mold as the earlier die-cast models, but features different wheels to better match the orbiting vehicle. The toy version of the car does not have a spacesuited driver. The real, full-size Roadster also had a few additional "easter eggs" installed, including a "Hitchhiker's Guide to the Galaxy"-inspired "Don't Panic" sign mounted over the dashboard screen and an internal circuit board that was inscribed "Made on Earth by humans." The release of the "Greetings from Space" 2008 Tesla Roadster comes on the heels of Mattel's other toy car line, Matchbox, offering a model of NASA's Space Exploration Vehicle (SEV) in late August. The Matchbox Sky Busters brand has also started selling a scale version of Sierra Nevada Corporation's Dream Chaser commercial space plane. SpaceX's first operational Falcon Heavy launch is expected in early 2019 with a communications satellite for Arabsat of Saudi Arabia, followed by a mission for the U.S. Air Force. The Swedish satellite company Ovzon and California-based ViaSat each recently announced their plans for Falcon Heavy launches between 2020 and 2022. Meanwhile, the Tesla Roadster that was launched in February continues on its path through space. It is currently beyond Mars at a distance of about 1.8 AU from the sun (astronomical units, or the distance between Earth and the sun). Or as the Hot Wheels toy's packaging reads, "Really far." See the back of the Hot Wheels "Greetings from Space" Telsa Roadster blister pack at collectSPACE. Follow collectSPACE.com on Facebook and on Twitter at @collectSPACE. Copyright 2017 collectSPACE.com. All rights reserved.